Wow, how did it get to be Wednesday already? This week is going to be a fast one, that is for sure. This week's Little Red Wagon challenge comes from Jan and she wants us to 'make it punny', which means she wants us to use a pun or play on words. This is so Jan's sense of humor. My daughter had some left over scraps from a birthday layout that she had been working on so she shared them with me and this is what I created. I have been doing some organizing in my scrap area and found these rolled candles which matched perfectly. Now, for the fun part........here is my 'punny' sentiment. LOL! Easy, peasy! That never happens for me! Thank you to Jan for challenging us this week. It was lots of fun. I hope you take some time and play along with us. Visit the Little Red Wagon blog and link up your creation and visit others to be inspired. Good Morning! I hope you are all having a good week! The weather has been incredibly lousy here, but I think today things are going to turn around. Let's keep our fingers crossed. I am excited to share my creations for Little Red Wagon. I am hosting again this week for Joanne, who is away on holidays. She wanted us to use a doily on our project. I used a Die-namics die to create my doily and embellished with a flower that I cut out of the pattern paper I was using with a brad in the center. I used a sticker for the banner and the letters. I added some bakers twine tied it into a bow. I used the new Cucumber Soup collection from Jillibean! I LOVE it. I hope you will take some time and play along with us at Little Red Wagon. Be sure to visit the blog and link up your creation. You can also visit the other 'girlfriends' for some extra inspiration. I have been playing with my Copic markers again and I wanted to share my latest card for Sassy Cheryl! I found this perfect quote for my card. 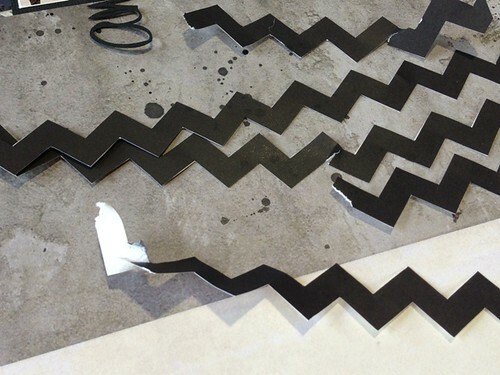 I made the strip into a banner by cutting the 'v' in the bottom and made a coordinating one for behind it. I used my Silhouette and the 'print & cut' option to cut out my digital stamp. I love how it makes the image just pop right off the card. Thank you Cheryl.....for making such amazing stamps! Good Morning! I am thrilled to bring you this weeks challenge.....it is my first one since re-joining the Little Red Wagon team. 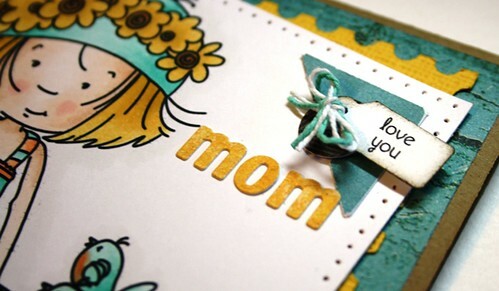 Mother's Day is coming up this Sunday so I felt it was an obvious choice to make this weeks projects all about Mom! I used an image by Sassy Cheryl and coloured it up with my Copics! I wanted to be sure to let her know how much I love her, so I added that to my sentiment by using a sweet little tag. 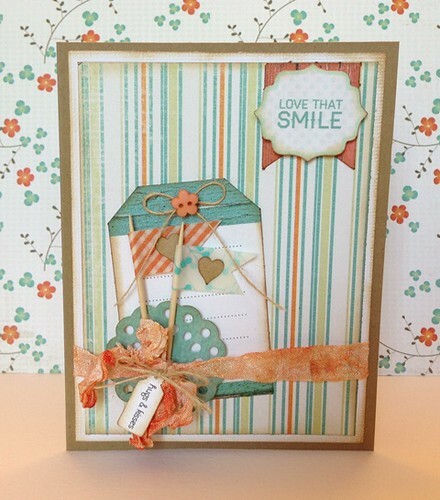 I hope you will play along with this weeks challenge and visit the Little Red Wagon blog to link up your creation. Good Morning! I am back to share with you my finished layout from the Two Scrapbook Friends progressive blog hop! To get all the details on the hop and see my layout for that, click here! I have been working on my son's travel album and I had a couple of zebra photos I still wanted to include. To complete the challenge, I needed to add Ann's quote and Amanda's 3 buttons. I added some border strips in the top left corner and a rub-on that I layered with some cardstock. I misted a wood veneer camera and added a brad to the center of it. I made a tab and added a sticker to one of my photos. 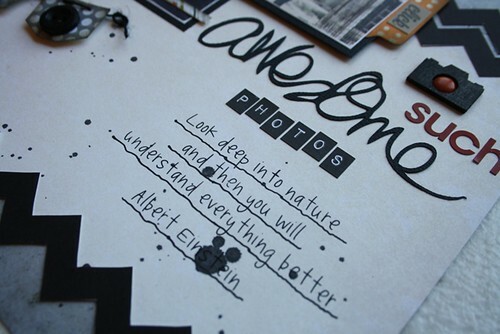 I found this awesome quote and used my Silhouette and pens to add it to my page. I underlined it with a black Sharpie. I added the three buttons to my banner. 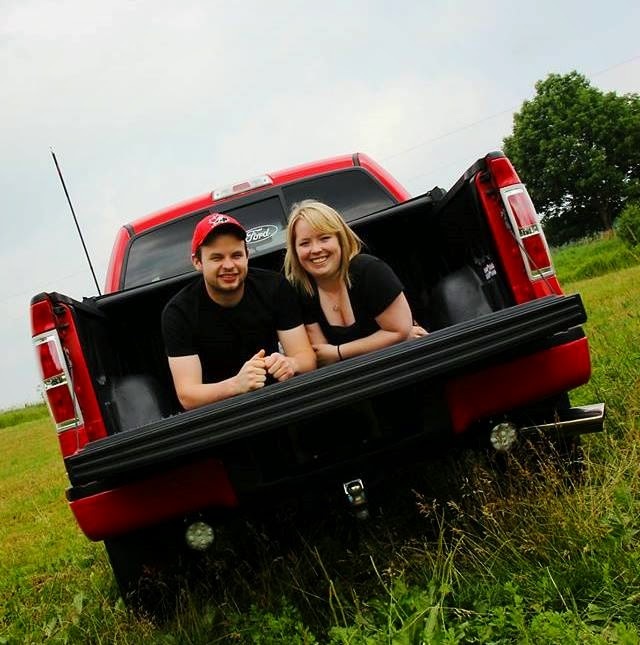 Thanks for stopping by and checking out my layout. I had a blast creating it and I am thrilled that I got another page done for my album. 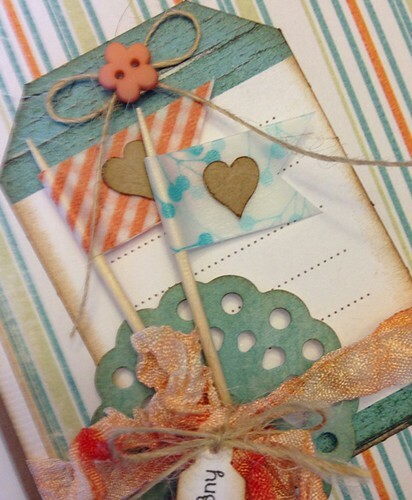 Two Scrapbook Friends Progressive Blog Hop! I hope everyone is enjoying the progressive blog hop! 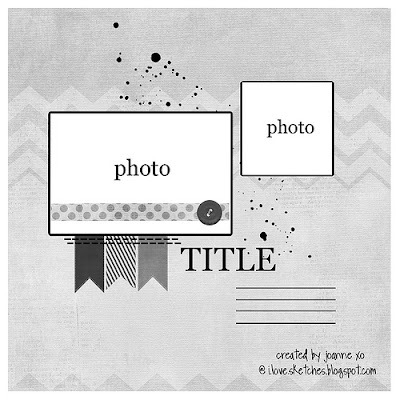 If you are arriving at my blog and have not visited the Two Scrapbook Friends blog, you should start there. All the details are posted here! The hop began on Joanne's blog with a stunning sketch that she created. She created a layout based on this sketch. Each designer that follows her on the hop will incorporate a new element of their choice plus any previous elements and then post their version of the sketch. So without further adieu, I would like to share my layout based on the sketch and including the elements that Shelby, Jayne and Christa challenged us to use. I shared this because I wanted everyone to know that everything does not always run smoothly when I create. I felt it was a good idea to insert my partially finished layout into the Silhouette to add some details with a sketch pen and upon unloading.....this is what happened! Grrrrr!! 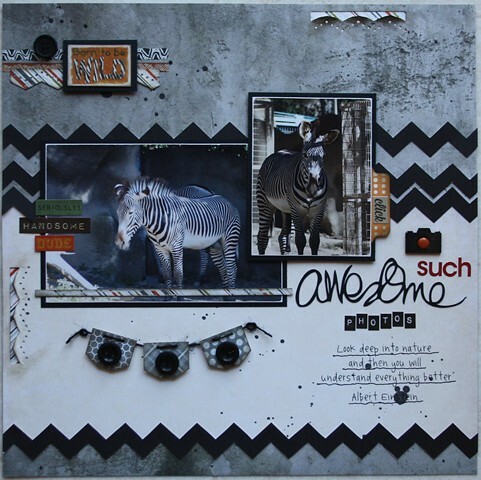 Here is my layout with Shelby's 'striped paper', Jayne's 'anything wet' and Ann's 'stitching' elements added. My element is to distress!!!! I sanded the edges of my photos (and I guess you can count my distressed chevrons too, but I did fix them)! 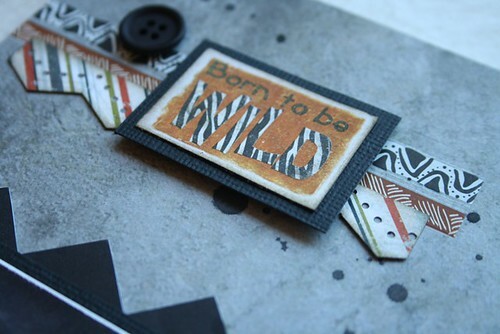 The striped paper is shown on a strip across the photo and behind the punched out sections along the left side and top of my layout. My 'anything wet' is the mist that I used on my background. I stitched my banner together using some black twine. For now, that is all I can show you. You will have to return here and to the Two Scrapbook Friends blog on Monday, May 6th to see my finished page. To play along, all you need to do is hop from blog to blog (in order) and leave a comment on each of the seven designers blogs. 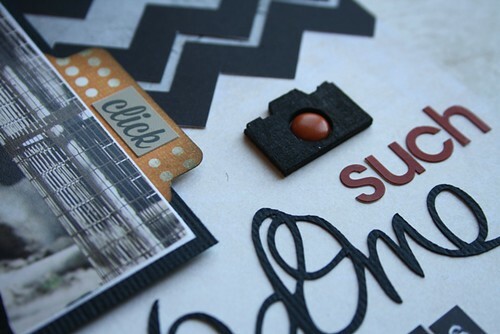 If you complete the entire Hop, and you leave a comment on each Friend/Designer’s blog and the Two Scrapbook Friend's blog by 11:59 pm on May 6th, you will be entered in a random drawing for a great prize! 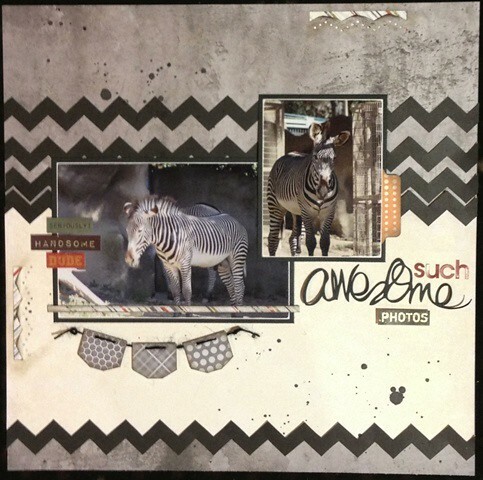 In addition, if you accept the challenge and create a design of your own and upload it to the Two Scrapbook Friends Gallery by 11:59 pm on May 31st, you will be eligible to win ANOTHER fabulous prize! 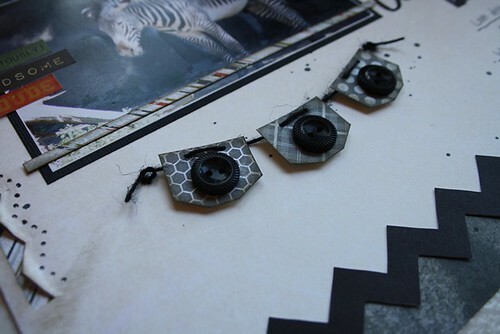 Finally, all the FINISHED TSF/Designer creations will be revealed on the Two Scrapbook Friend's blog on Monday, May 6th. I decided to make washi tape flags using toothpicks as the 'pole'! This was super easy and makes a very cute embellishment. I used up all sorts of scraps on this card. 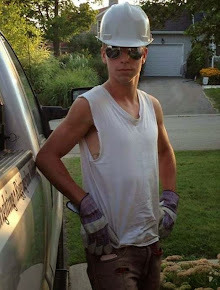 I think you should dig into your wagon and see what you have to use for this challenge. Don't forget to visit the Little Red Wagon blog and see what the other girlfriends have made.